Zapper — Stuff by J.K.
Kiln-Cast Glass, from a Lost-Wax Investment, Taken from a found object. Zapper is a fun object made purely out of nostalgic necessity. When holding the object, it is instilled with a newfound sense of gravity and power due to the sheer weight of being cast in a different material than the original toy's plastic. A conversation followed the object's creation relating to the over-abundance of gun-based toys targeted at little boys, and how these objects might frame their sense of power and masculinity later in life. This piece was created during my residence at The Oxbow School of Art & Artist Residency in summer, 2013. 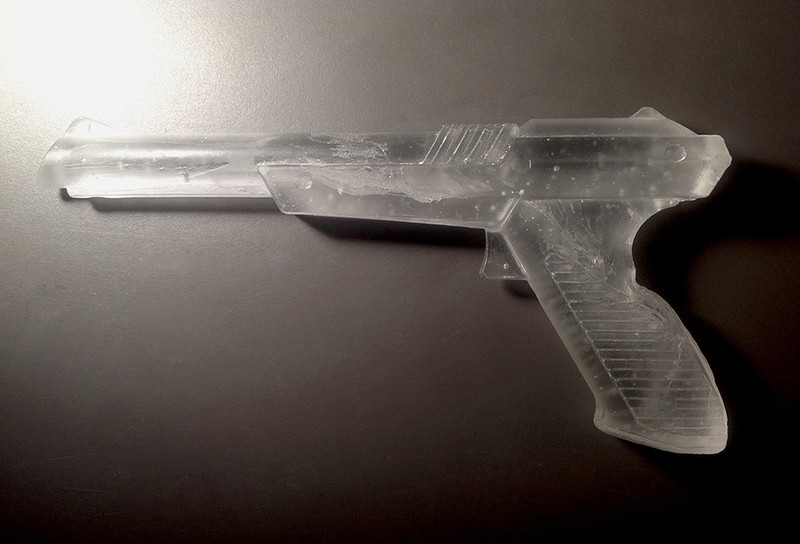 Zapper Gun was the product of a challenge to make a wax replica from a found object for use in a glass-casting demo in the matter of two hours. Many thanks to Oxbow for donating their faulty Nintendo Duck Hunt zapper for my purposes.